The Little Big Things, is a compendium of 163 ways to pursue excellence — with tips ranging from the blatantly obvious, "Show Up! (It's a Start.)" and "It's All About ... the Quality of the Workforce," to the wildly counterintuitive, "Boring Is Beautiful" and "Reward DNK (Do Not Know)," to the often repeated, "The Customer Is 'She.'" Its main message is that excellence is the result of many small tasks, all of which can be practiced and mastered. Don’t let the oversized bulk of The Little Big Things fool you: For a thick, 538-page book, its smart messages are short, valuable and to the point. Surprisingly, it is also a quick read. Its author, business expert Tom Peters, is world famous because he never stops rethinking how organizational excellence can be developed, and he has a wonderful way with words. The Little Big Things is packed with 163 things that can help business leaders move closer to the ever-elusive excellence they need to compete and win in today’s marketplace. 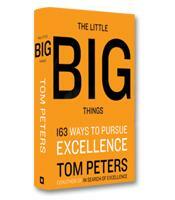 The ideas upon which Peters expounds in The Little Big Things are as accessible as they are compelling. Together, they form a well-calculated approach to enhancing a leader’s strategies so he or she can reach the ultimate goal of excellence. To help readers move directly to the specific guidance they need, Peters has corralled his thoughts into a variety of relevant chapters. For example, in his section on crisis, he offers several counterintuitive approaches to finding a less chaotic path. While addressing the topic of performance, he makes it clear that first and last impressions are vital, as are presentation skills and a leader’s ability to perform all the time. When discussing leadership, Peters points out that "measurably" helping others succeed is of primary importance, as are serving your people and employing the power of positive reinforcement. One of the wonderful things about Peters’ latest book is its use of his wild sense of humor. Peters delivers each heaping serving of brilliance with a dollop of quirkiness. With a firm grip on the balance between humor and solid advice, Peters proves once again that he can weave pertinent messages into a tapestry of quotations, conversations and joyful guidance. It is easy to see that he loves his job as a positive provoker. Who else but Peters can narrow down the concept of excellence into 19 "E’s," two of which are "ears" and "error-prone." Why "ears"? 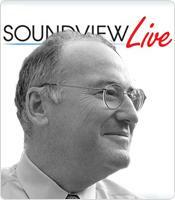 Peters writes that effective listening is a leader’s most important strategic advantage. What about "error-prone"? He explains, "Try a lot of stuff and make a lot of booboos and then try some more stuff and make some more booboos — all of it at the speed of light!" Who uses the word "booboos" twice in the same sentence while also providing perfectly clear encouragement to make the mistakes that improve one’s chances of attaining excellence? No one but Tom Peters. Another exciting aspect of The Little Big Things is Peters’ grasp of history and the people involved. Whether it’s references to the framers of the United States Constitution or reflections on the politics of the Cold War, Peters proves that he is as capable a pupil as he is an instructor. History, like business, is a passion that Peters communicates to readers throughout The Little Big Things. When he describes how making friends can help anyone become more successful, Peters counter-intuitively applies a tough leader’s thoughts to a supposedly "soft" topic by quoting Gen. Dwight D. Eisenhower, who said, "Allied commands depend on mutual confidence; this confidence is gained, above all, through the development of friendships." Peters explains that Eisenhower was renowned for his friend-making ability, and those words were offered to encourage American and British soldiers to get along long enough to fight their mutual enemies to win World War II. Peters writes that managers and supervisors can improve their chances of success by remembering to make friends along the way, "consciously and measurably and carefully." If you aren’t very good at making friends, Peters writes, remember that it is a "learnable skill," which can be acquired with some hard work and practice. If you need some guidance, Peters suggests that you read Dale Carnegie’s classic How to Win Friends and Influence People. Lessons and suggestions like these demonstrate Peters’ renowned expertise in the field of excellence, which was also evident in In Search of Excellence, the business classic that he co-wrote with Robert Waterman. In The Little Big Things, Peters continues to help readers create and cultivate the ever-elusive excellence that will help them improve their work.